Photo © Rachel Cooper, licensed to About.com, Inc. Traditional Christmas decorations at Colonial Williamsburg include wreaths and swags, using pine, boxwood, Fraser fir, magnolia leaves, assorted fruits and berries, and dried flowers. Each year, during the holiday season, the living history museum in Virginia offers “The Christmas Decorations Walking Tour.” This is a unique way to walk the grounds and enjoy the festive season. See the following photos and learn more about the historic decor. Residents of nearly 85 homes in the 301-acre Historic Area join in the holiday spirit each year by displaying traditional Christmas decorations. More than 1,200 electric candles in the windows of buildings throughout the Historic Area are lit at dusk each evening during the holiday season. Visitors can enjoy dining at the historic pubs, strolling through the shops, sipping hot cider, checking out the handcrafted gingerbread houses around town, and attending the classic holiday events. The residents of Colonial Williamsburg decorate with a variety of items to create unique Christmas wreaths and swags. A variety of holiday programs are held throughout November and December to bring the colonial period to life. The decor is simple yet elegant as it was during the Revolutionary times. 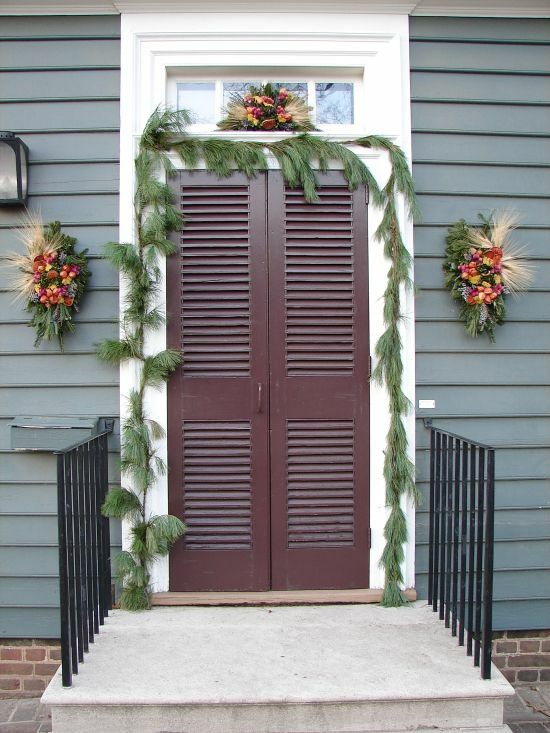 During the holiday season, apple swags sit above many of the doorways to the Colonial homes in Historic Williamsburg. The doorways are decorated creatively and it is fun to take "The Christmas Decorations Walking Tour" at Colonial Williamsburg. You can also take a "Holiday Decorating Tips and Inspiration" tour where you'll learn about techniques for working with fresh fruit, greens and other natural materials so you can make your own arrangements at home. More than 1,200 electric candles in the windows of buildings throughout the Historic Area are lit at dusk each evening during the holiday season. The residents compete for recognition of the best Christmas decorations in Colonial Williamsburg. The tour reminds visitors to appreciate old-fashioned wreaths, candles, flowers and natural arrangements. Christmas is a wonderful time of year to visit Colonial Williamsburg. Don't miss the Grand Illumination to kick off the season and special entertainment programs such as “A Capitol Evening,” (18th-century dancing), “Christmastide at Home,” and more. Throughout the holiday season, take the whole family to ​Christmas Town at Busch Gardens and explore the amusement park as it is transformed into a Christmas wonderland. The special event combines an immersive holiday experience with one-of-a-kind shopping and dining opportunities, holiday shows and a light-dancing Christmas tree. 10 Things to Do on Christmas Day in Washington, D.C.